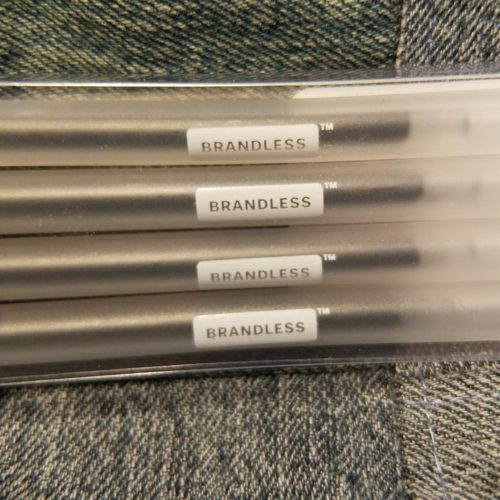 Like all the other Brandless items a 3-pack is $3. Each notebook contain 30 sheets or 60 pages. 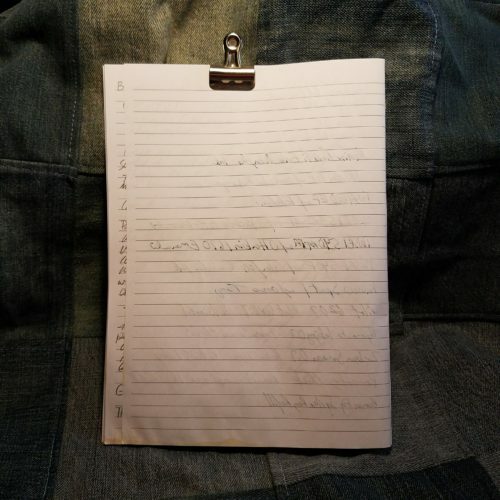 There are multiple signatures in each notebook and they are stitched together and then glued to the cover. The cover is soft and pretty floppy, it is impossible to write in hand with these notebooks. That said they are about composition notebook size and fit into any cover that fits comp books. The corners are square and not rounded. 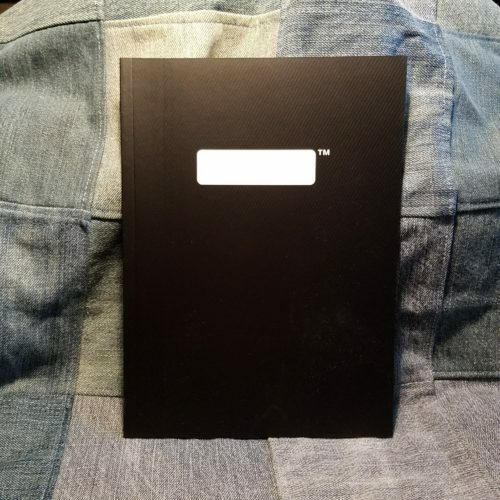 The matte cover features ridges of texture and a white area to write into, no Brandless info on the front cover. Discreetly on the back is the brandless logo. The paper inside is college ruled in dark gray. The ruling is dark enough that it doesn’t blend into the background but stands out. The paper is thin, very thin. It does not work well with fountain pens. Some of my inks feathered, but not all. Most all had show through and many had bleed through. Even some of my gel pens bleed through the page. The paper responded best with ballpoint and pencil. Pencil was really nice on this paper. 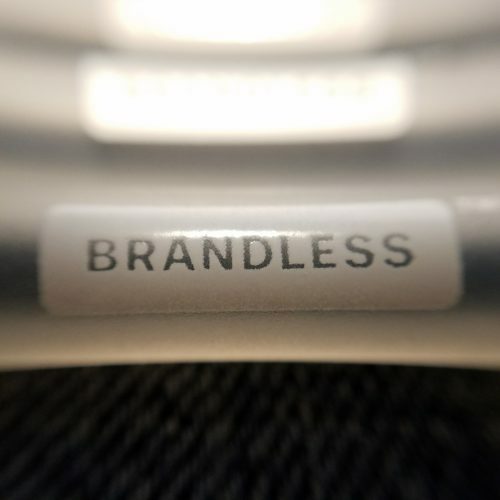 This entry was posted in Review and tagged brandless, cheapie on 20180607 by leslie. The Brandless brand is a simple set up- think Muji but American and with a focus on groceries. As a small upstart brand, they are interesting. Their schtick is that everything on their site is $3, and you qualify for free shipping at $30, or 10 items. They have frequent free shipping offers, so you can often get your goods at $3. The look of Brandless is minimalistic and simple. Labels are barebones and, I find them aesthetically pleasing. 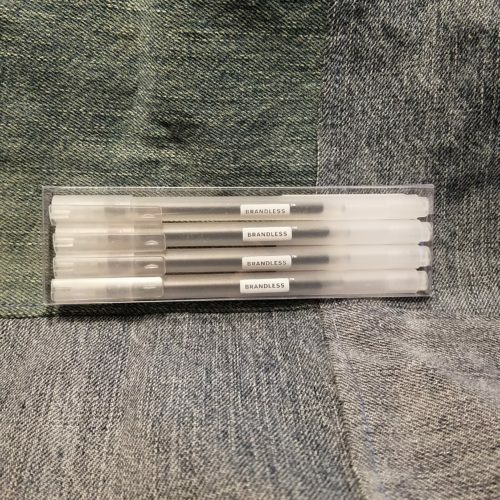 The pens are available in a 4-pack for $3. The package is a clear hard plastic box. The backside sports a white label with product info. Simple. 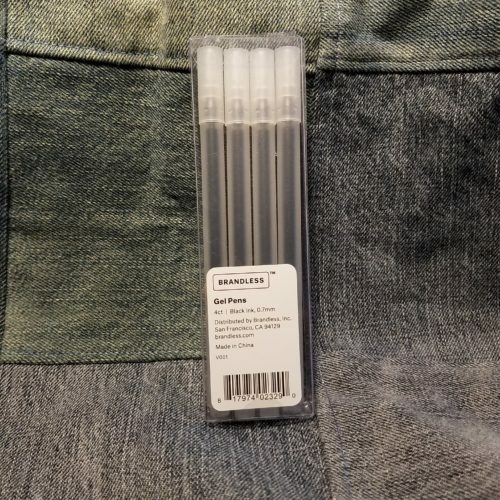 The pens are semi-opaque white frosted plastic. 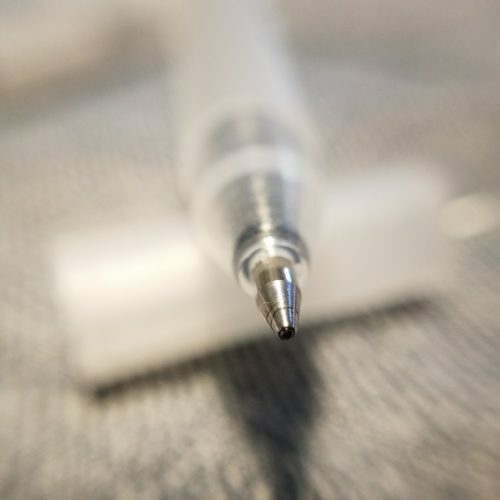 The plastic is matte with a glossy white “Brandless” label printed in the middle of the pen. Simple. 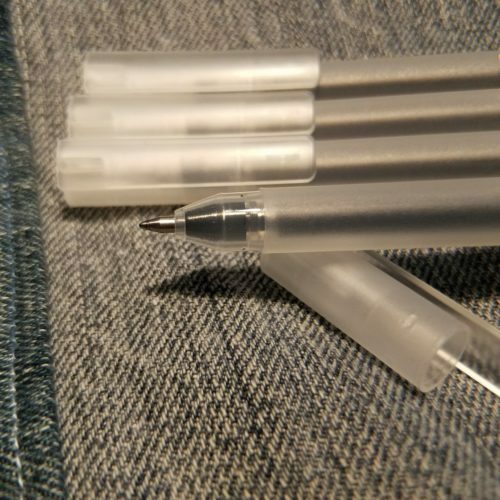 The cap is short and reminds me of many other inexpensive gel pens, specifically Poppin, but without the bright colors and carefully designed clip. 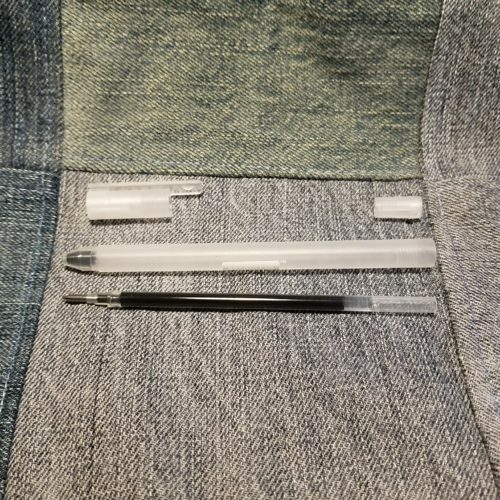 The clip on the Brandless pen does its job, holding the pen to a notebook or the placket of a shirt. The cap is short. It offers a soft click as the pen is capped or posted. 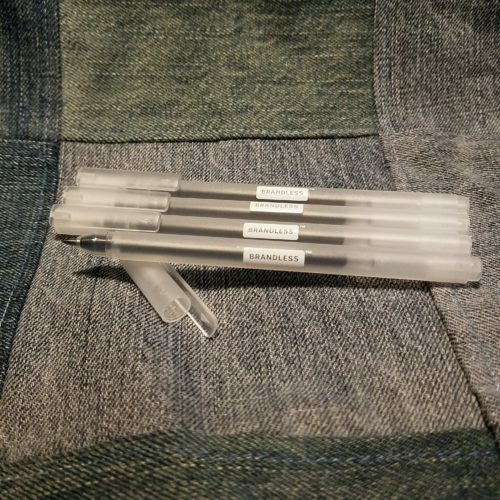 The pen posts easily and the cap stays in place. The cap does not stay put if you clip the pen to your lapel or put it in your pocket. the cap will fall off. The good thing is that the gel ink doesn’t seem to bleed too badly into the fabric of your pockets but it is a danger. Don’t pocket carry if you like your pants. The refill is held in place with a rear cap that screws into place. When my pens arrived this rear cap was loose on two of the four pens. It was easily screwed down with my fingers. Once tight the refill doesn’t move or wiggle. It is quite an efficient method of holding the refill in place. I found that several of the refills weren’t as full as others. In use I find the pens quite comfortable, they have a slightly thicker body than other gel pens. They fit my hand well. If you grip your pens close to the tip you might find that the drop between the tip and body is uncomfortable. 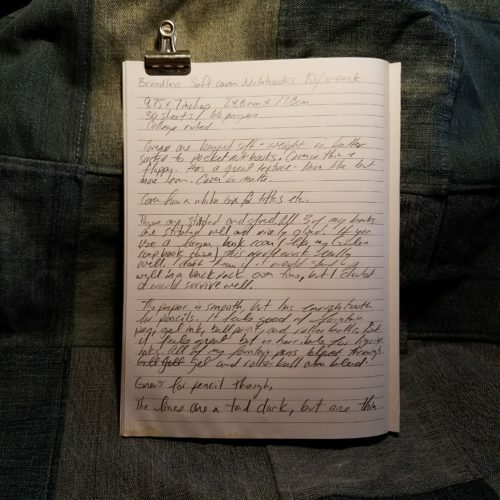 The ink flows smoothly and darkly without soaking through most of the pocket notebooks I use, or the crappy paper at my DayJob. 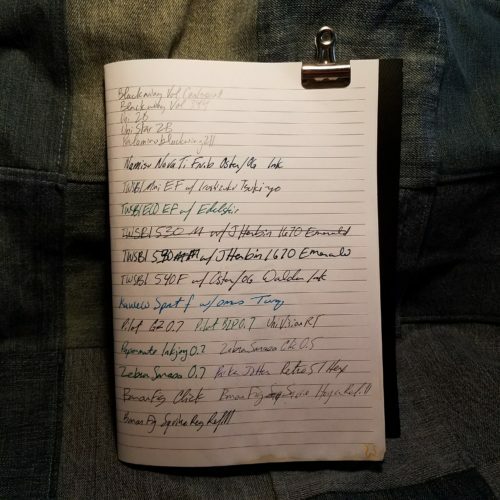 They respond quite well to crappy DayJob paper but also in my Baron Fig confidant I use as my book journal. 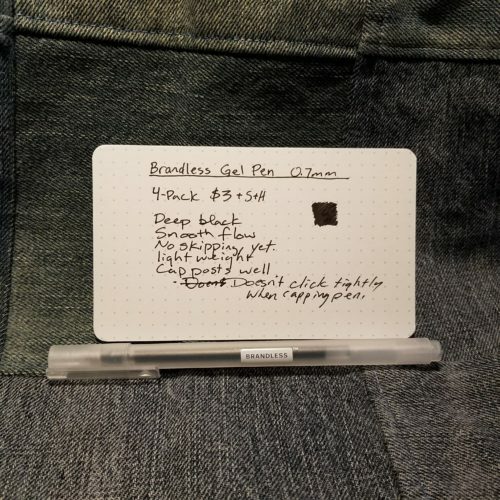 This entry was posted in Review and tagged brandless, gel, pen on 20180410 by leslie.